Promoting “genderless parenting” contradicts what the facts show us about the benefits of having a mom and a dad. So what do the decades of research on fathers say? Boys from fatherless families are twice as likely to end up in prison before age 30. Girls raised in homes without their fathers are much more likely to engage in early sexual behavior and end up pregnant as teenagers—for example, girls whose fathers left home before their daughters turned six are six times more likely to end up pregnant as teenagers. Children who grow up without married mothers and fathers are also more likely to experience depression, behavioral problems, and school expulsion. There is also more abuse in homes without fathers. In studies of physical, sexual, and emotional abuse, fathers living with their children emerge as strong protectors—both through watching over their children’s activities and communicating to others that they will protect them. In one study, abuse was 10 times more likely for children in homes with their mother and an unrelated boyfriend. These differences can partly be explained by the fact that these children are more likely to grow up in poverty. But that too reveals the importance of dads, as married fathers are the primary breadwinners in almost 70% of married families—providing resources that benefit children in a whole host of ways. In spite of this evidence, some academics and voices that shape public opinion are asserting that fathers are not, in fact, essential. As two researchers recently argued in a top-tier family science publication, “The gender of parents only matters in ways that don’t matter.” Though it may be important to have two “parental figures,” their genders and relationship to the child don’t matter that much. Fathers—as well as mothers—are supposedly disposable when it comes to their own children’s development. Not surprisingly, arguments for “genderless parenting” are often based on a particular view of what defines male and female equality. Depending on the definition, one can do what the other can do, and do it just as well, if given the chance. Thus, mothers and fathers are interchangeable, and one or the other gender is unnecessary and replaceable. It’s easy to see why these claims seem believable. We all know mothers who are breadwinners, and fathers who perform the traditional female role of providing full-time quality child care. And a body of research shows that fathers have both the desire and capacity to be protective, nurturing, affectionate, and responsive with their children. But are fathers and mothers really the same? Do mothers “father” and do fathers “mother” in the same way the other would do? Canadian scholar, Andrea Doucet, has explored this question in her book Do Men Mother? Her extensive research with 118 male primary caregivers, including stay-at-home dads, led her to conclude that fathers do not “mother.” And that’s a good thing. Although mothering and fathering have much in common, there were persistent, critical differences that were important for children’s development. 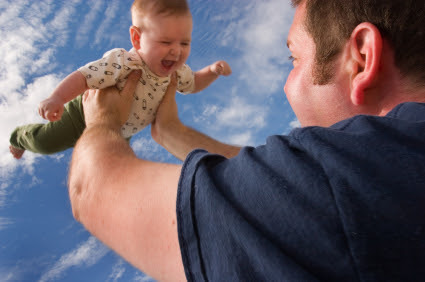 To begin, fathers more often used fun and playfulness to connect with their children. No doubt, many a mother has wondered why her husband can’t seem to help himself from “tickling and tossing” their infant—while she stands beside him holding her breath in fear. And he can’t understand why all she wants to do is “coo and cuddle.” Yet as Doucet found, playfulness and fun are often critical modes of connection with children—even from infancy. Fathers also more consistently made it a point to get their children outdoors to do physical activities with them. Almost intuitively they seemed to know that responding to the physical and developmental needs of their children was an important aspect of nurturing. When fathers responded to children’s emotional hurts, they differed from mothers in their focus on fixing the problem rather than addressing the hurt feeling. While this did not appear to be particularly “nurturing” at first, the seeming “indifference” was useful— particularly as children grew older. They would seek out and share things with their dads precisely because of their measured, problem-solving responses. The “indifference” actually became a strategic form of nurturing in emotionally-charged situations. Fathers were also more likely to encourage children’s risk taking—whether on the playground, in school work, or in trying new things. While mothers typically discouraged risk-taking, fathers guided their children in deciding how much risk to take and encouraged them in it. At the same time, fathers were more attuned to developing a child’s physical, emotional, and intellectual independence—in everything from children making their own lunches and tying their own shoes to doing household chores and making academic decisions. As she evaluated these differences, Doucet wondered if fathers just weren’t as “nurturing” as mothers. Their behaviors didn’t always fit the traditional definition of “holding close and sensitively responding.” But a key part of nurturing also includes the capacity to “let go.” It was this careful “letting-go” that fathers were particularly good at—in ways that mothers were often not. Her findings provide empirical evidence for the feelings described on Public Discourse by Robert Oscar Lopez in his recent account of growing up without the influence of his father. Lopez yearned for what kids in traditional families often take for granted—the opportunity to learn how to act, speak, and behave in ways that reflect the unique gender cues provided by the parenting of a father and a mother. Although Lopez would have appeared normal on most sociological indexes (as a well-trained, high achieving student), inside he felt confused. In his own words, he grew up “weird,” unable to relate to or understand either gender very well. And that made it hard to understand himself. Andrea Doucet ends her report by sharing an illuminating moment from her research. After a long evening discussing their experiences as single dads, Doucet asked a group of sole-custody fathers, “In an ideal world, what resources or supports would you like to see for single fathers?” She expected to hear that they wanted greater social support and societal acceptance, more programs and policies directed at single dads. Instead, after a period of awkward silence, one dad stood and said, “An ideal world would be one with a father and a mother. We’d be lying if we pretended that wasn’t true.” Nods of agreement followed with expressions of approval from the other dads. Although many had had bitter experiences of separation and divorce, they couldn’t help but acknowledge the inherent connectedness of mothering and fathering—and the profound deficit experienced when one or the other is not there. Arguments for the non-essential father may reflect an effort to accept the reality that many children today grow up without their dads. But surely a more effective and compassionate approach would be to acknowledge the unique contributions of both mothers and fathers in their children’s lives, and then do what we can to ensure that becomes a reality for more children. Jenet Erickson is an assistant professor in the School of Family Life at Brigham Young University. This article has been reproduced with permission from Public Discourse. This article is published by Jenet Erickson and MercatorNet.com under a Creative Commons licence. You may republish it or translate it free of charge with attribution for non-commercial purposes following these guidelines. If you teach at a university we ask that your department make a donation. Commercial media must contact us for permission and fees. Some articles on this site are published under different terms.